If you have good stock, you’ve got the keys to the Kingdom sat in your fridge or freezer. The stock I usually make is based on a recipe I found in the first Chinese cookbook I bought way back in the 90s. Not only do I use this stock in Chinese dishes, I also use it in other types and styles of cooking, too. Works like a charm. This entry was posted in Uncategorized and tagged Chinese, eggs, mushrooms, paleo, recipe, shiitake, soup on November 20, 2014 by paleovirtus. “It Sounds Better With a Foreign Name” Productions proudly present “Gamle Kitans Nötblandning”! Relax, it’s Swedish, mate. This fair Northern tongue means you no harm. “Gamle Kitan” – means “Old Kitan” – me in other words (“Kitan” is my Swedish nickname ). “Nötblandning” simply means “Nut mix”. This, then, is my own personal preferred blend of nutty goodness, my snack of choice for those awkward moments when I’m between bowls of fruit. Books and articles on all things Paleo tend to oscillate wildly between 2 contrasting positions when it comes to the topic of fruit and nuts. Some more or less advocate filling your proverbial boots, suggesting that your are free to eat until replete. Others seemingly warn that the merest sniff of a banana or the very sight of a cashew nut will be enough to instantaneously triple your weight. I’m just lucky then, I guess. I can scoff fruit by the bucketload, and enjoy a small bowl of nuts several times a day, without gaining weight. Simply place the nuts and coconut flakes in equal parts in a large lidded container. Shake well to mix thoroughly. The coconut flakes have a tendency to sink to the bottom of the container, so get in the habit of giving it a good shake before each serving. 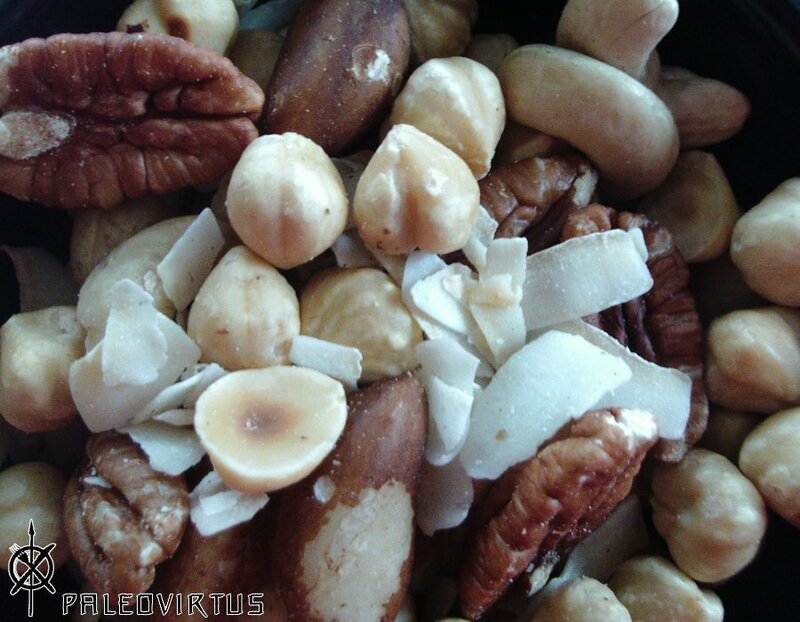 This entry was posted in Food Diary, Recipes, Uncategorized and tagged Brazil nuts, cashew nuts, Coconut flakes, Hazelnuts, nuts, paleo, Pecan nuts, recipe, snack, walnuts on October 16, 2014 by paleovirtus.